Not all music is created equal, or so said Jed Carlson, the co-founder and president of ReverbNation, a Durham-based company that’s in the business of providing online tools to help independent musicians market and sell their music online. Founded in 2006, the company has racked up about 3.1 million users of its online tools that help artists promote their music on Facebook and YouTube, to email out newsletters or easily get their music into online stores like iTunes. Now Carlson said the company is looking to move to the “natural next extension” of its business. Part of the problem they’re trying to solve is finding and sorting music now that the Internet lowered the barriers to entry so that anyone with a keyboard and a computer can publish music online. It’s not about sorting “good versus bad music,” Carlson said, but about sorting music by potential commercial application -- whether it be for a performance or as a jingle in an advertisement. “Our focus is going to be sorting our content for the benefit of industry,” he said. 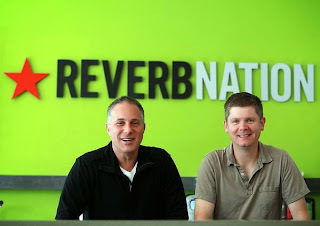 ReverbNation launched initially based on the founders’ belief that due to the Internet, music would be a “world of a million niches,” co-founder and CEO Mike Doernberg said. In the first two years, Doernberg said the company didn’t bring in revenue as they focused on building their products and customer base. They started monetizing their services in 2008, and hit their stride in 2011. This year, the company is now on track to bring in more than $18 million in revenues, Doernberg said. To accommodate growth in its workforce, the company moved into new office space on North Duke Street near Brightleaf Square. The company now has 85 people offices in Durham and New York. The new area of focus for ReverbNation is on growing a segment of their business that he said could grow sales by much as 10 or more times. The company is looking to add tools to allow music industry professionals – record label companies, event promoters and others –to more easily find music for commercial use for performances, commercials, TV or other uses. The company has hired curators to listen to and categorize music on their website, he said. They’re looking to beef up a product that allows users to search their artists by genre, and that has bands categorized by their expected use or achievement level. Carlson said they expect those tools to benefit music industry professionals, rather than fans, because he said they believe it’s not as competitive in that area. And while he said the music business has changed, he said there will be a need for the record label. Doernberg said labels, like college football coaches, have had to “be everywhere” to find talent, he said. Expanding on his comparison, he said coaches with fewer resources have smaller talent pools from which to choose their recruits. “(With) a company like Reverb, (you) can look at every player, you can contact them with the click of a button,” he said. By helping music professionals, he said, they’re also looking to help artists that use their website to get connected. “Our mission is to create an environment for the artist to be successful,” he said. Deborah Gerhardt, an assistant professor at the University of North Carolina at Chapel Hill School of Law, said that since it’s easy to publish and distribute music due to the Internet, there’ s more music out there. The role of the record label is to help listeners “figure out, OK, what should I listen to now?” she said. And she said she liked the idea of a business that brought independent bands together with people want to use their music commercially. “It’s really a great thing,” she said. Ken Weiss, entrepreneur-in-residence at UNC-Chapel Hill’s Music Department, said he believes ReverbNation manages an “enormous amount” of independent music traffic, and has done that pretty well. Now he said the business probably has realized their original vision, and they want to take a next step.